Here's a great new online slots game from Blueprint Gaming you can play. Red Dragon online slot game is basically your tutorial on how to be a ninja. You’ll learn the importance of stealth in this game as well as how to successfully infiltrate an enemy’s lair and make away with his gold. By the time you’re done here, you’ll be ready to serve at MI6. This Vegas online slot game features several bonuses and a jackpot. All the focus of this game is on the 5 reels. The dark background makes you centered on the reels with no distractions. They have an outline of golden ornaments with Chinese dragon figures at the top of each frame. The controls are tucked at the bottom. There are more than 50 fixed win lines. Each player’s goal is to score symbol combinations on these winning lines. If you love promo's don't forget to visit our slot promotions page. Red Dragon is by Blueprint Gaming. The company has been in the slot gaming world for years. In 2008 it was acquired by Gauselmann group, a German gambling corporation. Some of their games resemble movie/TV franchises and that’s because they have licenses to create them. Some games in this company have multiple bonus features and bonus games, while others don’t. What all their games have in common is smooth gameplay and professional production. 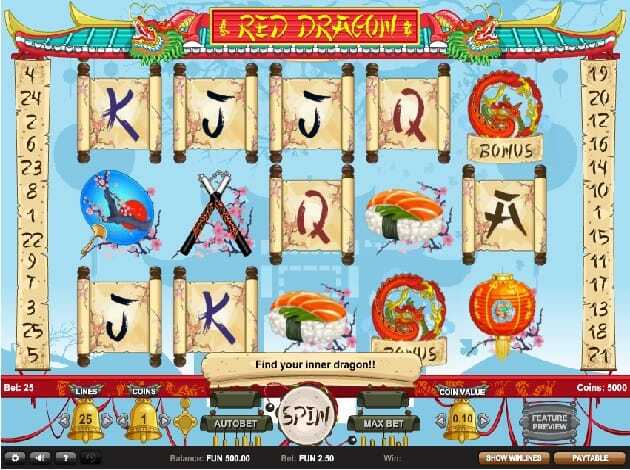 Red Dragon is easy to follow and offers players many chances to win at every spin. The goal of the game is to score winning symbol combinations on any of the 50 win lines. The (-) and (+) buttons found under the reels help players choose their total bet value for next spins. The amount you stand to win is determined by the type of combinations that appear on your screen and the wager size. This part all depends on your luck, but you can always increase your bet on the next spin so as to increase the size of your rewards. The paytable in the game follows a classic pattern with a few tweaks. Symbols are split into two groups. The rewards here correspond to a bet made for one credit. The classic stack of card icons has been redesigned to look like Chinese characters. Players can recognize numbers 9 and 10, Queen, King, Ace and Jack easily. The rewards can start at 0.20 to 5 credits when you have these as winning combinations. Other symbols include red tokens, nunchaku, yin-yang symbol, and the ninja star. The yin-yang and red token accept 2-symbol combinations and reward a maximum of 8 credits. The golden dragon earns you 10 credits, but is rare to spot on the reels. Hidden bonuses- There are plenty in Red Dragon and offer many free spins. Wild symbol- The wilds here are ninjas. Ninjas can substitute for all the symbols on the reel. 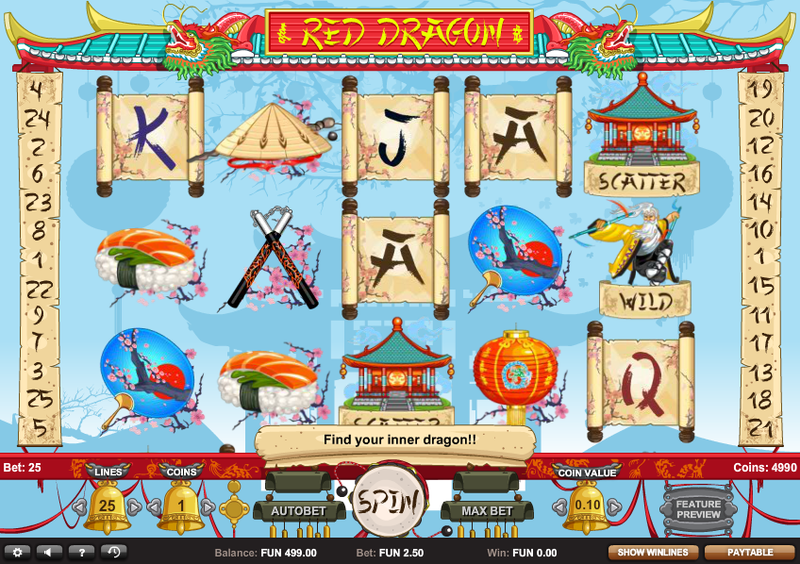 Scatter symbol- When 3 Red Dragons appear anywhere on the screen, the award 5 credits, 14 free spins and stacked wilds. If you find 3 “Enter the dragon” scatters during these free spins, you lock the bonus round. Bonus round- In the bonus round free spins continue until a tiny dragon is seen on the third reel. Keep one eye on the reel at the centre at this time. If you see a gold dragon there, you are one step closer to winning the ultimate jackpot. Red Dragon is a decent slot game with so much intrigue. It’s definitely one of those that will keep you locked in ready to win those basic rewards on your way to the big jackpot. You’ll appreciate the decent graphics paired with exciting bonuses ready to save the day. Unleash your inner dragon and aim for as many special symbol combinations as you can.